The IEEE 802.11 MAC is the second layer in the OSI stack. It contains functions to provide reliable data delivery, to control the access to the shared medium and to protect the data delivered. The Clear Channel Assessment (CCA) is a mechanism for determining whether the medium is idle or not. The CCA includes carrier sensing and energy detection. The Carrier Sense (CS) mechanism consists of a physical CS and a virtual CS. The physical CS is provided by the PHY and is a straightforward measuring of the received signal strength of a valid 802.11 symbol. If it is above a certain level the medium is considered busy. The virtual CS is provided by the MAC and referred to as the Network Allocation Vector (NAV). The NAV works as an indicator for the station when the medium will become idle the next time and is kept current through the session duration values included in all frames. The NAV is updated each time a valid 802.11 frame is received that is not addressed to the receiving station, provided that the duration value is greater then the current NAV value. By examining the NAV a station may avoid transmitting even when the physical CS indicates an idle medium. The energy detection procedure attempts to determine if the medium is busy by measuring the total energy a station receives, regardless of whether it is a valid 802.11 signal or not. If the received energy is above a certain level the medium is considered busy. The thresholds for both carrier sense and energy detection are predefined in the standard. For 802.11a the carrier sensitivity is ­82 dBm and the energy detection threshold is ­62 dBm. Apart from the risk of collisions, the wireless medium is often noisy and unreliable in itself. Therefore the MAC implements a frame exchange protocol that lets the receiver confirm a received frame by sending an acknowledgment (ACK). In case the sender does not get this ACK the frame is retransmitted. There are also retry counters and time limits that restrict the lifetime of a frame, which prevents the MAC from re­sending the same frame forever. IEEE 802.11 consists of a Distributed Coordination Function (DCF). The DCF coordinates the use of the medium through use of CSMA/CA and timing intervals. These timing intervals are slot time, short inter­frame space (SIFS), distributed inter­frame space (DIFS) and extended inter­frame space (EIFS). SIFS and slot time are the shortest intervals and the foundation of the others. In addition there also exists an optional Point Coordination Function, which is not considered here. When the MAC receives a request for a transmission, the medium is checked by the physical and virtual CS mechanisms. If both of them indicate an idle medium for a period of DIFS or EIFS, the transmission is allowed to begin. DIFS is used after ordinary data frames and EIFS is used after detection of an erroneous frame. The SIFS is used when a station needs to keep the medium for additional transmissions like in ACK or CTS/RTS exchange and no other stations should be able to interfere. If the medium is considered busy by either of the CS mechanisms, the MAC will choose a random back off interval. The back off interval is a number, randomly chosen by a back off algorithm. The number represents the amount of time the station has to sense an idle (no transmissions) medium before it may attempt to start its transmission again. The distribution of random numbers has a predefined range, which is doubled with every attempt to transmit a frame until a maximum is reached and the frame is discarded. The range of the distribution is called Contention Window (CW). In case a frame is successfully transmitted the CW is reduced to its minimum value. The back off number decrements each time the medium has been free during a slot time and when the back off expires the station can begin a transmission. It is possible for two stations to choose the same back off interval, which will lead to a collision. Notice in the figure that defer access is slightly longer than busy detect. The reason is that the medium has to be free for a DIFS (or an EIFS if the previous frame was corrupted) before the back off counter starts. A problem with wireless systems is that every station cannot be expected to hear all other stations as in a wired network. The problem is referred to as the ``hidden node situation''. This situation occurs when stations are located such that station A cannot hear station C and vice versa, but both A and C can hear station B. Suppose then that A attempts to transmit to B. According to A's CCA, the medium is free and A begins a transmission to B. Unfortunately, the transmission cannot be received as B is occupied by decoding a transmission from C.
Two additional frames called Request To Send (RTS) and Clear To Send (CTS) address the problem. In this case the potential sender first requests the receiver permission to send by an RTS­frame. 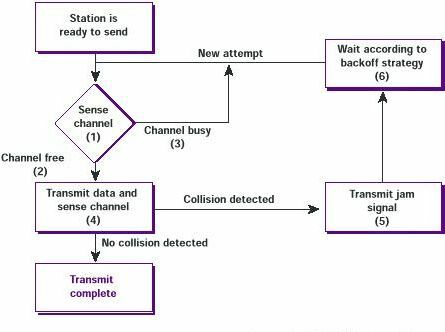 If the potential receiver is able to receive the RTS it returns a CTS­frame and the station can begin the transmission of the data frame, otherwise it cannot. All stations that receive either the RTS or the CTS will update their NAV and potential collisions can be avoided. The RTS/CTS procedure is an optional feature, which is configured to be used for packets exceeding a specified size. The next page will give an overview of the new additions to the 802.11 standard. Wireless Communication © 1993, 2004.